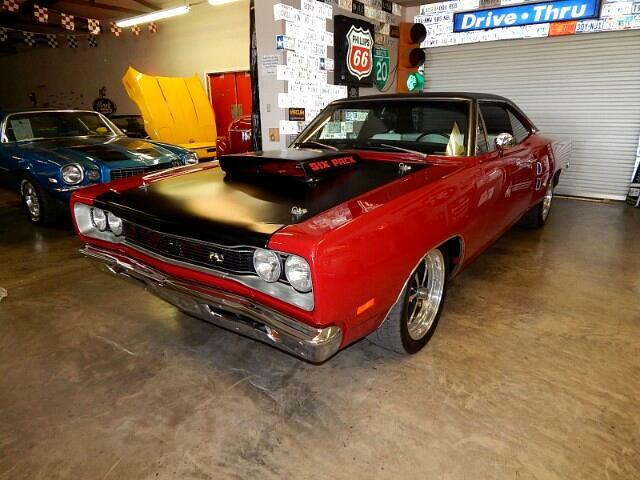 Lone Star Muscle Cars IS Proud To Present this Super nice Dodge Super Bee. Born In Saint Louis In 1969 With A 383 High Performance Motor That has been upgraded to a 440 with the all famous Six Pack. Now this car is only showing 267 miles on it since it's complete restoration. Let's Take a look under the hood. You will find a fresh 440 With the six pack serpentine belt system MSD ignition system Headers Classic Air-conditioning, Power Steering and touches of chrome and of course the cool Four Speed In The Floor. To keep this beast under control she has Willwood Disc brakes on all four corners mounted to American Racing Aluminum Rally 500 Wheels. On the Exterior You Will Notice a show quality paint in Bright Red With The A12 Black Fiberglass Style Hood With Pins and a all New Black Top. Tinted Windows Keep the heat out and the Cold A/C in With The White Leather Bench Seat this is a cool car to drive in the summer time. On The Interior you will notice the all new Dakota Digital Gauges With A Very nice Kenwood Sound System with Sub In the Trunk All New Leather Interior. This car was built for pro touring so it is ready for the road just to give you an example i drove it today it was 112 Degrees outside the car temp ran at 205 Degrees Big Block In the Summer time in this heat that is Sweet. Now At 60 MPH She is Turning 2200 RPM So Yes this is a car you can drive anywhere. Please call for more information. Message: Thought you might be interested in this 1969 Dodge Super Bee.